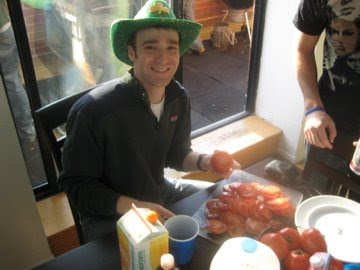 So in an expertly worded email, my good friend (and former BGSK contributor), Adam, asked this wise question: what better way to celebrate the feast day of the patron saint of Ireland than by drinking at the home of 3 Jews in Chelsea before wandering aimlessly along the banks of New Jersey? And as some of us sat in our cubes pondering the journey across the Nile and other Hebrew school-friendly analogies, 50-70 friends of friends of friends opened their forwarded emails, and answered McMoses’ call—not by RSVP-ing, mind you (which would have saved several English muffin runs mid-party)—but by silently thinking to themselves in not-so-distant office cubes across town: why yes, nothing could be better. 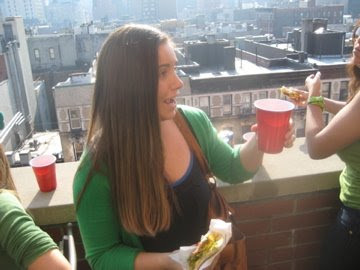 I’d like to think it was the earthly promise of my green eggs and ham that lured so many of our brethren to Adam, Jamie, and Dave’s apartment that day. But likely it was more due to the added value of 10 dozen farm-fresh eggs that my friend Ethan had his dad hand deliver from the Silverstein family farm, his home in Connecticut. Now I know what you’re thinking: how come even the farmers in this story are Jewish? But as Plunkett and the other good men of Tammany Hall would have it, there was also a pretty healthy showing of Irish freckles, led by but not limited to Miss McEvoy, Mr. Fitzpatrick McKenna, and Mr. Compton Delaney of the County Cork Delaney’s. 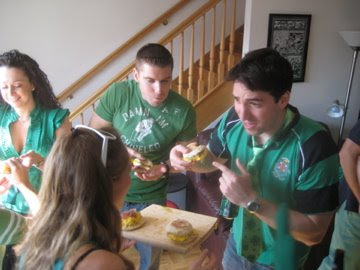 It took a week of recovery, but 80 English Muffins, 10 dozen eggs, and 8 pounds worth of post-Patty patties later, I’m ready to dish on the secrets behind the proverbial melting pot of this successful 8am awakening. And, only because I asked him nicely after a few of Keith’s Rasputins, Adam agreed to reveal the recipe for his famous man burgers that kept us going (after a serious 3pm power nap) long into the night. Oh, and, Happy St. Patty’s Day! My theory behind all of these parties is to arrange the food so your guests can serve themselves buffet style. However, due to the one cookie sheet in the boys’ possession, we were forced to serve only as fast as the muffins became toasted and available, making Muffin Man Mike a main contender for MVP of the party. 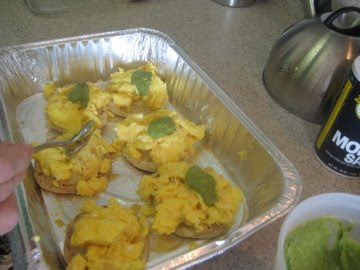 Mike melted and toasted, I scrambled, and Nicole managed the assembly line, arranging finished muffins and eggs on a variety of serving surfaces, and then I gave them loving dollops of homemade pesto and the gift of trafe (for those Jews and Irishman who choose to consume it). 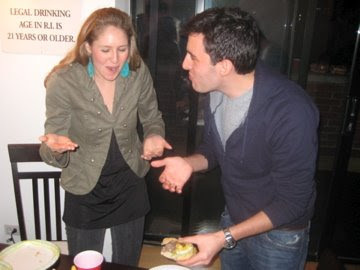 Luckily, the kitchen productivity met the general ebb and flow of the arriving guests, and my past waitressing skills made river-dancing across the room while carrying a platter of McMuffins all the more graceful. NOTE: this recipe produces about 3 cups to a quart of pesto. 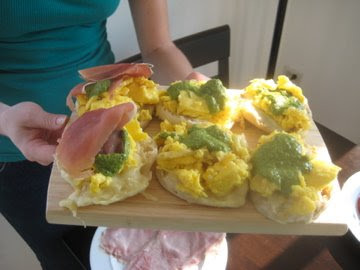 We ran out about a third of the way into the breakfast sandwiches, so I would recommend making the full recipe and freezing whatever you don’t end up using for another use (preferably with pasta), or just halving the recipe above. NOTE: I had the boys buy half prosciutto, half generic ham for budget purposes. Heat a large non-stick skillet (as deep as you have) over medium heat. In a large mixing bowl, whisk together the eggs and the salt. Add as much of the egg mixture as possible to the pan without risking overflow when you scramble. It’s okay to do these in batches. Or, work two skillets at once and split the eggs evenly between them. As the eggs begin to set on the bottom, scrape with your spatula constantly. When the eggs are almost done, return the heat to the lowest setting and make sure all other elements are ready to serve. The eggs will continue to cook a bit and stay warm for your guests. 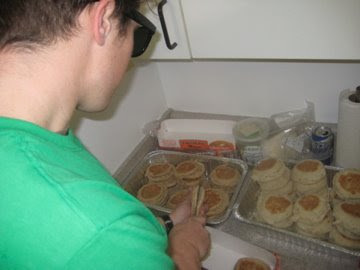 Meanwhile, slice the English muffins and place the tops on one large cookie sheet or baking pan, and the bottoms on another. Depending on how many muffins you are working with, you may have to do this in batches. Place both pans in a 350°F oven for 3-5 minutes until they have begun to toast but are not fully browned. Remove the pan with the muffin bottoms. Arrange one slice of mozzarella on each and return to the oven for another 3-5 minutes. You want the tops to be slightly browned and for the cheese to be fully melted on the bottom. Set out the two muffin pans, a plate of ham, the pesto, and tomatoes (if you’ve decided to go this route) and allow people to serve themselves buffet style at the stove before passing through the gauntlet of accoutrements. The recipe you’ll see below is the result of years of trial and error, and using whatever condiments or spices we had in the kitchen to get the taste just right. As Phoebe informed me last time, ingredient quantities like “a poop load” aren’t particularly helpful, so I tried my best to quantify what was coming out of my crazy hands into these tasty morsels; that said I encourage you to mix and match as you see fit. I recommend my burgers to be served on a sesame seed bun with cheese and some mashed avocados on top along with the holy trinity of mustard, mayo, and ketchup. Finally, the burgers should be cooked medium rare, as only fascists and people concerned with their health/well-being eat burgers more well done than that, and I try not to associate with either of those groups. Place the meat in a large mixing bowl or casserole dish. In a smaller bowl, combine the egg, salt, pepper, garlic salt, soy, bbq, Worcestershire, steak, and teriyaki sauces. Stir well and add to the meat bowl. With clean hands, incorporate the liquids into the meat. By the end of this intimate time together, the meat should be moist and should smell pretty good. If that’s not the case, add a little bit more Luger’s and Worcestershire sauce. Once meat is at the desired consistency (or olfactory state of deliciousness), form it into burger patties about the size of your palm. 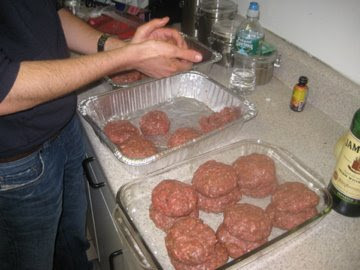 My preferred portioning is just under half a pound per person (about 12 patties for this recipe), leaving them just wide enough to fit on your buns after a good trip to the grill. Get the grill (or grill pan) nice and hot. 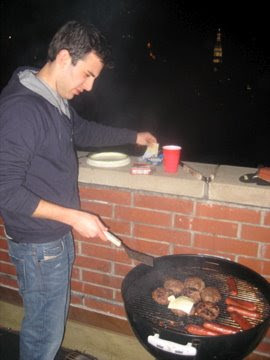 If on an outdoor grill (Phoebe’s family is partial to Webers), cook the patties with the top on for about 5 minutes (until the bottom becomes seared and the top begins to gray) and then flip. Replace the top and cook for about 4 more minutes. When close to finished, add cheese and briefly toast the buns. Once cheese is melted, serve immediately. 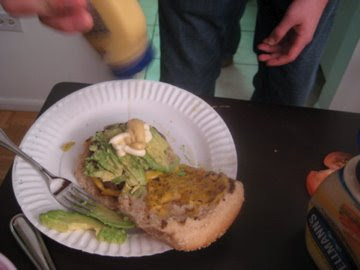 Recommended serving technique as follows: take a few avocado slices, mash them up with a fork (so that they don’t make the bun slippery) and then put them on top of the burger. Add mayo and mustard on the top half of the bun, and create a generous kiddie pool of ketchup on your plate for dipping. Enjoy with friends, though preferably not at the same time. Who had to clean up after THAT party?